Xtreme Power, the well-funded grid battery startup whose ambitions flamed out in bankruptcy this January, has a new owner. On Tuesday, the Lyle, Texas-based startup’s assets were acquired by Younicos, a Berlin-based grid battery and energy management startup. Terms of the deal weren’t disclosed, but Xtreme creditor and “stalking horse” bankruptcy bidder Horizon Technology Finance announced Monday that it received $9.9 million in cash for its share of the bankrupt company. Horizon had previously committed to outbid any offers under $10 million, which appears to indicate that larger bids hadn’t emerged. That’s bad news for Xtreme’s investors, of course. Since its 2004 founding, Xtreme has raised about $55.7 million from investors including SAIL Capital Partners, Bessemer Venture Partners, The Dow Chemical Company, Fluor Corp., BP Alternative Energy, Dominion Resources, POSCO ICT, Skylake & Co. and Spring Ventures. But Xtreme had only $34,000 in cash and $10 million in debt when it filed for Chapter 11 bankruptcy protection in the U.S. Bankruptcy Court for the Western District of Texas. But it’s a good deal for Younicos. The startup, founded in 2006 by executives at German solar manufacturer Solon, has about 10 megawatts of projects in the ground or being built, and is developing about 10 megawatts more across Europe. It's small compared to Xtreme, which has 60 megawatts of grid-scale battery storage up and running in twelve projects around the world. Xtreme CEO Alan Gotcher stated in January that the startup’s pipeline of business was in excess of $100 million, with letters of intent for another $65 million on top of that. But whether Xtreme’s current roster will equate to future business is less clear, on several fronts. The first is the future of Xtreme’s “PowerCell” advanced lead-acid battery chemistry itself. Xtreme put its factory up for sale in April 2013, but hadn’t found a buyer as of its January bankruptcy. Xtreme hasn’t disclosed prices or costs for its battery technology, so it’s hard to say how competitive it was against established grid-scale battery manufacturers like Panasonic, Mitsubishi, LG Chem, Samsung, and Saft. It does have significant projects in the ground, including the U.S.’s largest, a 36-megawatt, 24-megawatt-hour system sited at Duke Energy’s Notrees, Texas wind farm. But Xtreme has also seen confidence in its product drop since a 2012 fire that destroyed its 15-megawatt energy storage facility in Hawaii. Its most recent projects use lithium-ion batteries from the aforementioned OEMs, not its own chemistry. The track record of companies competing against these giants on mass manufacturing batteries isn’t good, as highlighted by the bankruptcies of A123 Systems, Ener1, Exide and International Battery. 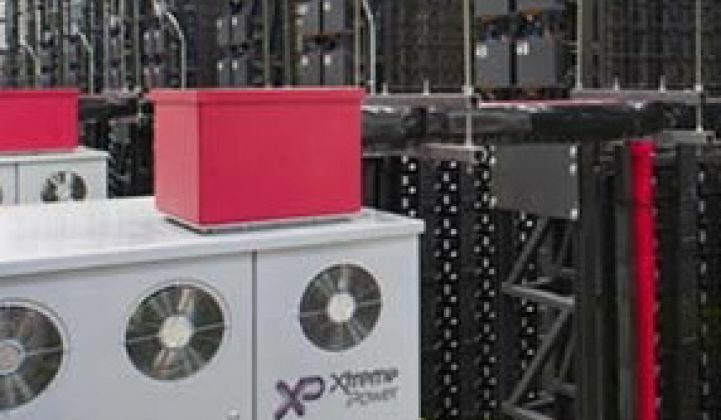 That appears to leave Xtreme’s battery management system (BMS) -- the hardware, software and services to keep grid-scale battery units running smoothly and optimizing their money-making capabilities -- as its primary asset. BMS platforms are valuable, and a host of startups are focusing on them as a software-based, startup-friendly way to get into energy storage. But real-world expertise is also worth a lot. Consider A123 Energy Storage, the grid-scale portion of bankrupt U.S. lithium-ion battery manufacturer A123 Systems, which was sold by Chinese owner Wanxiang to Japan’s NEC last month. Younicos doesn’t make its own batteries, but has put its software to use controlling sodium-sulfur batteries for projects in Berlin and on the island of Graciosa in the Azores, and lithium-ion batteries in England. It also has investors from the battery world, including Samsung for lithium-ion batteries, and Germany’s Gildemeister, maker of a vanadium-redox flow battery called the CellCube that provides multiple hours of storage for wind or solar power shifting.